Each of the Daily Green packets contains organic moringa, matcha, spirulina, and chlorella as well as organic agave inulin, a prebiotic said to support intestinal health. Organic coconut flavor along with lemon, mint, and monk fruit give the drink its minty, subtle fruit finish. You can add the packets, which boasts 1 billion CFUs and 20 calories each, to hot beverages, stirring with a fork or small whisk to fully incorporate, or simply enjoy the refreshing green-juice ingredients on the fly by adding the probiotic powder straight into a chilled water bottle and giving it a vigorous shake (it might taste chalky otherwise). 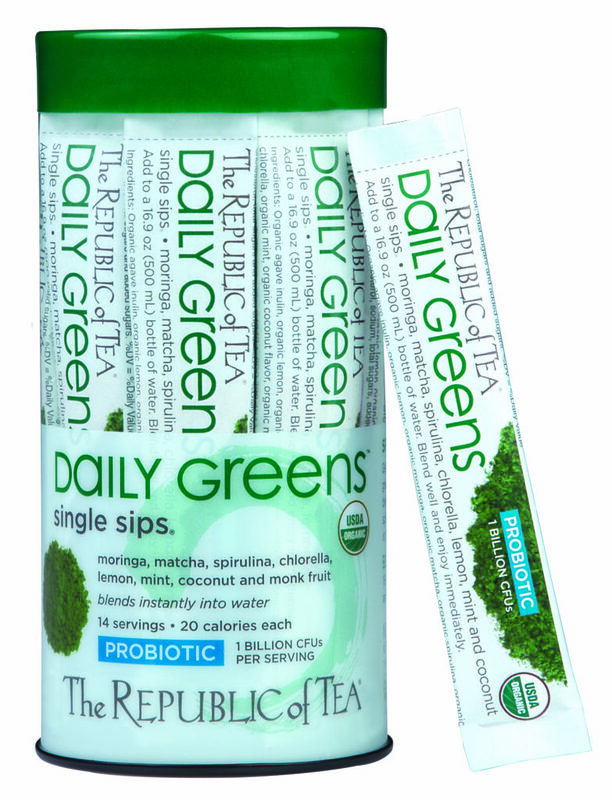 A two-week supply of Daily Green Single Sips, packaged in a recyclable PET canister, costs $19.99; amazon.com or republicoftea.com. A pre-packaged SPOONFUL of yet another thing. The world is getting trashed by this kind of packaging nonsense. If you can’t scoop a spoonful of loose powder out of a container and mix it into liquid, I dunno what to say. Yes, I’m also writing to Republic of Tea. I am with you! No more unnecessary plastic packaging please.